Last week, when on a road trip in Ireland, a worrying ping followed by a warning light appeared on the dashboard – as we were merrily cruising along a remote country road. The car was asking us to check the pressure of the tyres – in the middle of nowhere. It picked its moment! Why suddenly then? Did we have a slow puncture? Had we been driving for too long? Had the nasty pothole we had driven over an hour ago caused one tyre to loose pressure? We discussed a number of possibilities but could not settle on the cause. When we eventually reached our hotel (there being no garage on route) we looked at all the tyres and kicked them. They all looked and felt fine. Next day, after turning the engine on, the car pinged at us again and the dasterly warning light came back on. Eventually, we found a garage and checked the tyres – getting our hands filthy from twisting the caps off. All was fine. We turned the engine back on but the hazard light was still glowing menacingly on the dashboard. When we got home I phoned the local VW dealer to ask them how to turn it off. They told me to switch on the car entertainment system and navigate through a series of sub menus until I reached one that said ‘car’ settings. When I tried I found everything but the menu of ‘car’ options. So I gave up and instead drove to the dealer. A friendly mechanic sat in the car, poked around and eventually located a small button inside the glovebox hidden obscurely right at the top. He pressed it for a few seconds and the warning light went off. There was nothing wrong with the tyre pressure. Just every now and again the car thinks it should let you know you should check them. How annoying is that piece of software design? Especially when it is not smart enough to tell you how to turn the warning light off or, what to do after you have checked them and they are fine. Which design engineer came up with the smart idea of placing the reset button in a place that is impossible to find? And which sensor engineer came up with the idea of asking you to check your tyre pressure at some random time through using a warning sign on the dashboard – causing unnecessary anxiety? Meanwhile, in the States last week, a Jeep Cherokee got hacked into by some clever security guys – through its connected entertainment system. They wanted to demonstrate how it was possible for anyone with some smarts to control the car remotely. The car company recalled all of its 1.4 million Jeeps to patch the software fault. No-one got hurt but those guys caused an enormous amount of anxiety and worry amongst owners of a Cherokee. Just imagine if some real hackers had actually taken control of some random guy’s Jeep and driven it into a ditch or towards oncoming traffic. The security guys certainly made their point. Let’s hope the sensor technology and the intelligence behind them gets a little smarter and secure in the future. Yesterday, I went with R to Knightsbridge to check out the super bling cars that appear at this time of year for a few weeks, when the mega-rich come over from the Middle East to do a bit of shopping in this exclusive bit of London. They have their special shiny cars flown over for the occasion. 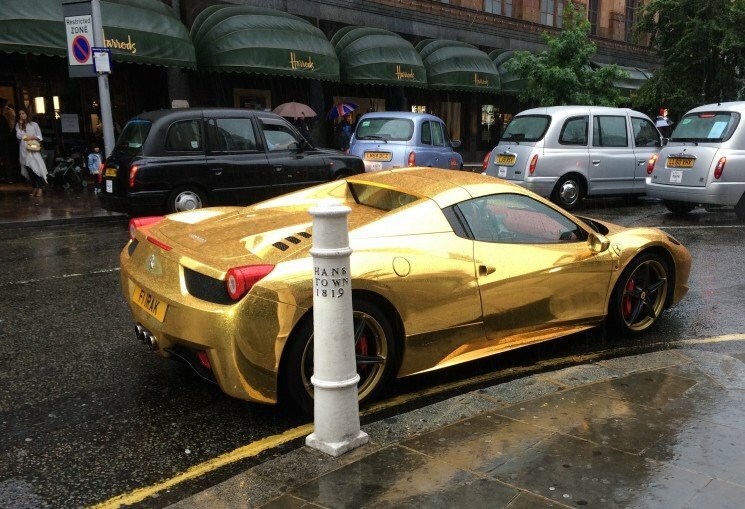 Against a backdrop of torrential rain we spotted several of them parked illegally outside Harrods. 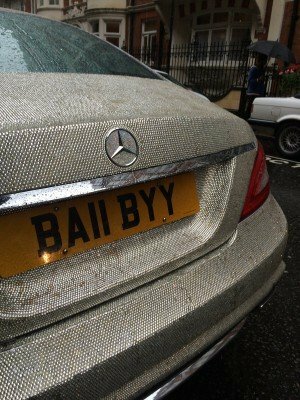 Our favourites were a gold-plated Ferrari and a Swarovski crystal-encrusted Merc. Both had their own personalized number plates: F1 1RAK and BA11 BYY. The dazzling goldie is owned by a former Iraqi (sic) world kickboxing champion called Riyadh Al-Azzawi. The twinkly sparkler is owned by a 22-year old Russian student called Dario Radionova who had the bright idea of covering her car in tiny crystals to make it look like the ultimate jewel. 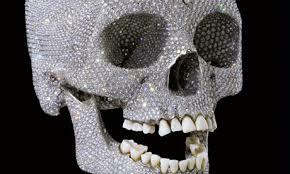 Beats Damian Hirst’s diamond skull by a mile – for sheer audacity, head turning awe and ultimate glamour. Everyone who walks past these cars cannot but stop, stare and snap; not quite believing what they are seeing. The ultimate car is one that glitters not one that tries to be too clever by half.